Dental implants are the revolutionary, state-of-the-art tooth replacement option that can save your smile. They provide many benefits which are unmatched by traditional tooth replacement solutions like bridges, partials or dentures. Dr. James Hutson in Marietta, GA, wants you to know more about dental implants and what they can do for your smile. 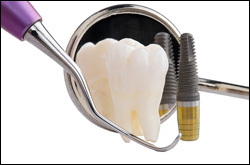 Once the implant screw is firmly embedded and your tissue is fully healed, Dr. Hutson will place a natural-looking dental implant crown on top of the screw. You now have a new tooth! Dental implants can replace one or more missing teeth. They can also provide a supportive framework for a denture, which is snapped in place over the implants. Interested in replacing a tooth with Dental Implants? Call James Hutson, DDS, PC in Marietta, GA today at (770) 424-7525 to schedule a consultation!